The trading of precious metals, such as gold and silver, have been a point of great debate for many years. This was greatly fuelled by the performance of the gold price throughout the early 2000s. In the 11 years, from January 2001 until January 2011, the price of gold increased more than six fold, from $257/oz in 2001 to $1734/oz in early 2011. That represents an annual return of 18.9%. Over the same period, the S&P 500 actually fell slightly, providing a negative annual return of 0.5%. This rapid rise in the value of precious metals bought a merry band of supporters who suggest that precious metals are an integral part of any investing portfolio. However, many people strongly disagree, citing that precious metals have generally under-performed the equities market over the long run whilst being much more volatile. So, who’s right? 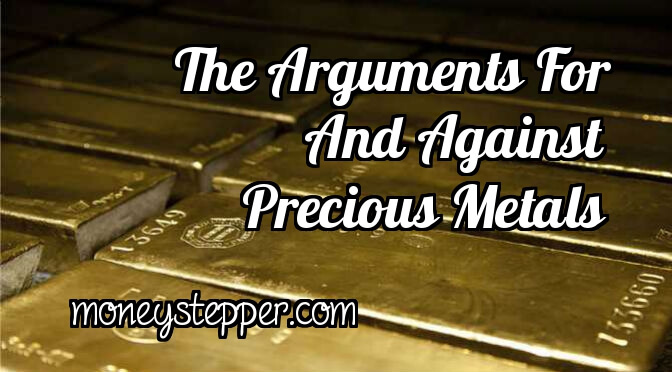 Today, we’ll take a look at both the arguments for and the case against trading and/or investing in precious metals. Whilst the rise of precious metals prices in the 00s was a little bit of a one-off in the extremity of the positive performance, they have historically performed very well in times where inflation rises. This, theoretically, makes them a good hedge against a struggling economy; whether caused by long-term decline in an economy or a major single political or social event. Diversity is absolutely essential in any investment portfolio that will stand the test of time. Being overly exposed in any individual company, sector, industry, currency or country can lead to extremely high variance and uncertain returns, even over the long-term. Those who recommend investing in precious metals therefore highlight the strength that they can have in diversifying a heavily equities based portfolio. However, the variance with precious metals can be high. We mentioned in the introduction that the gold price increased by 18.9% on average for 11 years until 2012. In the next four years, the price then fell by 30%. Therefore, whilst they may have some qualities to diversify a portfolio, the increased variance might not help that much! Precious metals investors, as with property investors, will tell you that they feel much more comfortable investing in something that they can see, touch and hold. Property investors know that (subject to a natural disaster) their bricks and mortar aren’t going to vanish overnight. Equally, investors who choose coins, bars, bullions or other physical forms of precious metals can make a similar claim. As such, many investors in gold will choose to buy the physical form from suppliers such as Stunt & Co, and then keep their physical assets in safe storage. Investors in companies that go into administration or liquidation (such a BHS at the time of writing) will struggle to suggest that their investments had similar robustness. Whilst investors in physical metals will promote the strength of holding a physical asset, doubters of precious metals investing will tell you that gold and other precious metals are expensive to hold. Unless you store your investment in an extremely safe place (such as a safe or vault), then your entire investment could be at risk of theft. Such storage solutions can be extremely expensive and can eat into any capital growth that the investments may enjoy over time. Property investments benefit from capital growth over time, but they can also be let to tenants and the owners can enjoy income from their assets. Equally, equity investors (especially in established companies) will earn capital growth from their investments, but also earn income in the form of regular dividends. However, precious metals have no income producing ability. As such, investors can only earn capital gains from their investment and cannot supplement this growth with income. Not only does this limit the earning potential, but it also means that the investor benefits in no way from cash flow. Investors in equities can invest through either a stocks & shares ISA, or via a pension in the UK, meaning that any capital gains and income from their investments is not subject to tax. The only way around this and to be able to invest in gold through a tax-wrapper is to invest in gold ETFs or similar. However, these investments are usually in companies that deal in gold, rather than in the precious metal itself. As such, the investor won’t truly be investing in the precious metals themselves and hence would not benefit from the advantages mentioned above. So, precious metals have both advantages and disadvantages. Volatility is high, and historical returns are generally lower than equities. However, there are many pros beyond the returns that supporters of precious metals will cite in having precious metals form part of a well-diversified investment portfolio. Good points on precious metals investing. Secure storage for your investment is always a concern, especially if you’re concerned about gaining access to it in a bank emergency a la FDR’s 1933 executive order. On the flip side, buying paper gold, such as GLD, you never know if what you’re paying for actually exists anywhere outside the computer. Tricky, but you have to put your trust somewhere, either in yourself, or someone else.